We met a couple of guys who rode their motorcycles up from Vancouver, BC and were headed to Inuvik. They offered to take the requisite picture of us in front of the sign marking the Arctic Circle. The scenery here was beautiful and only the long drive back to Tombstone Park finally urged us on our return trip. We had originally thought we would drive to Ft. McPherson or even Inuvik . But 400 miles on this road takes about 7 hours. We were already 3 full days out from Anchorage and a week into the trip. We wanted to spend a couple more days enjoying Dawson City, too. We jumped back on the Dempster and headed out. About 70 miles South of Eagle Plains the low tire pressure came on and a bad sound could be heard. We pulled off and got out to see what was going on. We each got out and shouted to the other – “we have a flat”! Damn. We had flat tires on both rear tires. 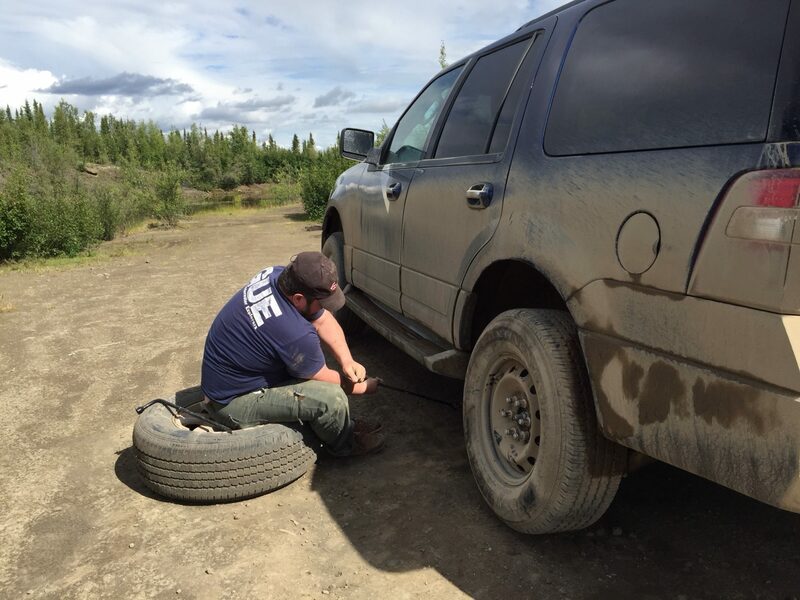 Picture yourself in this situation: 70 miles from the nearest gas station at Eagle Plains and over 200 miles from Dawson City (actual civilization). 1 Spare tire and 1 Slime Tire Repair kit. No cell phone connection on the Dempster. No patrolling Mounties. No. None. Zero vehicle traffic. 70F Degrees and no shade. That was us. The first tire was easy. Just changed that out for the full sized spare. Worse part was listening to Billy complain about the POS jack that comes standard with vehicles. The second tire had us a little concerned. We’ve never used this green goo called Slime and the tiny little air compressor didn’t look like it could handle my big SUV tire. In the slime went through the valve and we started the compressor. 20 minutes later and the tire was inflated to about 15 PSI. But it was still hissing and losing air! What if it didn’t fix the tire? What would we do? 2 cars had passed us without stopping and going the wrong direction for our needs (heading toward Dawson City not Eagle Plains). Who knew when the next car or truck would go by us. I was not worried. Nope. Not at all. 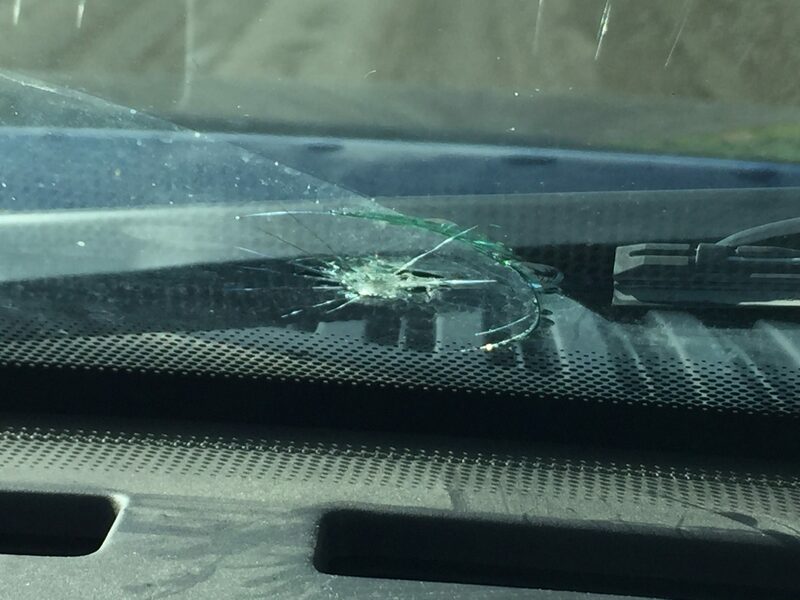 One of 2 window chips we got driving The Dempster Hwy. Billy jumped in the Beast and drove her down the highway in the hope that the slime would work its way around the whole tire and into the hole. When he came back about a minute later we listened for the hissing. Nothing. We inflated it for another 15 minutes and got it up to 30 PSI. No hissing. Hmmm. This might have worked. So now the decision had to be made. Do we turn around and go back to Eagle Plains Lodge and get the tires fixed? Maybe have to spend another day at the campground of hungry mosquitoes and the permanent rain cloud. Or take our chances and keep going to Dawson City where there was actual civilization and B&Bs where we could hole up until repairs where made. Did I mention it was 4pm by now and all I’d had to eat was a cup of instant Starbuck’s coffee and a granola bar? Those who know me well know what decision Billy came to instantly. Off to Dawson City we went. Trusting that the Slime would hold for the next 5 hours. It did and we decided to camp at Tombstone again since it was already 8pm when we drove by the campground. Dawson City was still 1 1/2 hrs away and I was ready to start gnawing off an arm from hunger. And it wasn’t going to be my arm I ate. So here I sit at 11pm at the most wonderful campground ever created by Canadians. No, we still have no cell phone or Internet. No towing available. Still not sure if the Slime will hold. But we have a nice private campsite with an awesome view and no swarms of mosquitoes. Tombstone campground was full by the time we arrived at 8:30pm. So we took the overflow spot. We were soon joined by a trio of very nice young Quebecois ladies who had driven 7 days to get here. They speak French and a little English. But enough that we could commiserate on the misadventures of long haul road trips. But first, sleep. Then a tire shop. A real Latte. Then a search for suitable accommodations with a shower. Not necessarily in that order.